Homemade chocolate recipe that is unbelievably easy to make with just 4 ingredients. Have you tried making chocolate at home? Yes, I’m talking about homemade chocolate made from scratch in the comfort of your own home! Making chocolate at home is not a tedious process as many assume. 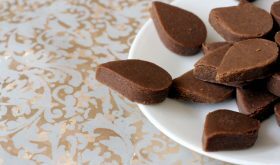 There are many methods to make this chocolate recipe but the one which works great for me is the sugar syrup method. The secret to making that perfect homemade chocolate that will give any store bought chocolate a run for its money is in preparing the sugar syrup to one string consistency. It is very very crucial to the making of a successful batch of homemade chocolate. You must achieve one thread consistency of sugar syrup which can be tested by touching the syrup between your forefinger and thumb. A thin string should be formed and should not break. If the string breaks, allow the sugar syrup to simmer for some more time. Milk powder and cocoa powder are the important ingredients that go into the making of homemade chocolate recipe. I must mention that using good quality butter and cocoa powder is imperative. A chef once told me that margarine works best but I have not used it for health reasons. You can add different flavors like chocolate essence, vanilla essence, cinnamon or espresso. I have not added any nuts or any other flavors. Nuts like crushed pistachios, pecans or almonds make for a good choice. Alternately, you can roll the finished homemade chocolate in desiccated coconut or colored sprinkles. Homemade chocolate pictures that you see in this post are the ones I gift wrapped for my son’s friend for his birthday. 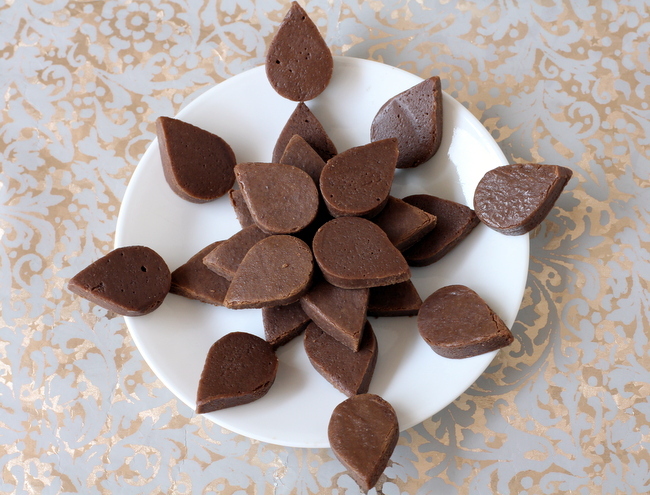 During festivals like Diwali and Christmas, homemade chocolates make for excellent edible gifts. Wrap the chocolates in pretty colored papers and gift them to family, friends or your Valentine. 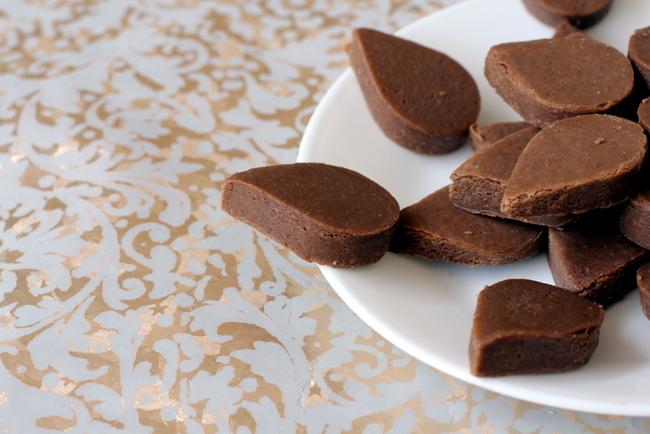 You will surely be getting positive reviews and requests for more homemade chocolate. It’s great that you can make them ahead of time since they keep well at room temperature. It makes for a perfect sweet treat to indulge in any time of the day! Next time you crave chocolate, stop rushing to your nearby store to pick up your favorite bar and instead make your own homemade chocolate. Sieve milk powder and cocoa powder and keep aside. Heat water and sugar in a vessel and bring to a boil. Reduce flame and continue cooking till the syrup reaches one string consistency. Add the butter and mix well till it melts and blends with the syrup. Turn off heat. Add the cocoa-milk powder mixture gradually (a few tbsps at a time) and mix well till glossy. Grease square pan or plate. Pour the mixture into the pan and smooth the top with a spatula allow to set for 10 to 15 mts at room temperature. Place in fridge for 10-15 mts. Remove from fridge and use a cookie cutter to cut into desired shape. Wrap them in colored papers and gift to family and friends. You can add crushed nuts of your choice. You can add 1/2 tsp of vanilla essence at the time of adding butter. Alternately, 2 tsps of strong coffee mixture can be added. If using cinnamon, add 1/4 tsp to the cocoa-milk mixture and sieve. To check for one string consistency of sugar syrup - allow the sugar to dissolve in water. Continue to cook the syrup on low flame. It will begin to thicken. When you touch the syrup between your forefinger and thumb, a thin string will form and it should not break. If it breaks, the syrup should simmer for a little while longer. By Sailu Published: April 12, 2013 Homemade chocolate recipe, an easy, tasty chocolate recipe that's kids love. Learn how to make chocolate at home with cocoa powder, butter & milk powder. Sure you can powder the nuts instead of crushed ones. Honey is a good idea too. Sugar can be cut down to a little more than 1/2 cup. sailu, what is milk powder n which braND? Sailu Garu, thanks for the recipe. I have been looking for one from so long!! If we want to substitue cocoa with carob, does the recipe change in anyway? Nice clicks and tasty recipe…but won’t it melt down or don’t it become sticky once after it is out of friz?? Will it be dry staying outside?? It will be sticky but will not melt when out of the refrigerator. 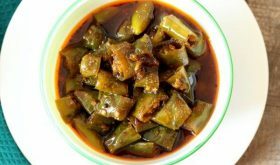 It can be kept at room temperature for 3 to 4 days and for at least few weeks in the refrigerator. woww ,feel like finishing that whole plate..
nice recipe sailu, i have one question, can i use milk instead of milk powder. Milk powder only for this recipe. Amul comes with different milk powder which one is the best????????? You will have to use milk powder for this recipe. I wish to prepare Chocolate Balls. Can I use same procedure/recipe given for the Homemade Chocolate? i have tried this once n the chocolate gets so hard …….. is it bcs of some error in wat i do or the proportion of sugar or water????? or the state of suger ( caramel or just melted) ?? I believe you have made the sugar mixture to hot, and so the cooled chocolate goes to the hard ball or hard crack stage. Try pulling the sugar of the boil sooner. help!!! im trying to make the suagr syrup right now but it’s been 10 minutes and it’s still runny and not a one string consistency, what do i do!? the chocolate i made is still soft and felxible, it’s not sticky though but it’s not hard. what did i do wrong?? you may be using lot of sugar syrup and small amount of mixture..
its because you used condensed milk. Condensed milk is used to make fudge. Instead of condensed milk, use only milk powder. That way it will be hard milk chocolate. Wow.. I tried this n tiz d best homemade choco around. Ur recipe is a real gem. V were havin financial trouble n d kids had choco cravings. Dats wen ur recipe came handy. Now d truth is v save money on chocos…whether for gifting or for personal use. I tried d nuts.. Almond n peanuts.. They taste real good. My seconf son nates nuts. But dis choco he loves. I make it ngive daily two pieces . N keep it stored for three weeks. It doesnt ext for more time dan dat. Den a new batch is prepared. Thanx to u n oder blogging sites, peopl like me who found it hard to cook hav started loving cooking. Thanx once again. I would certainly recommend dis choco to al. good pls what do you mean to grease the pan? with what? Measure the butter before its melted. should i grease the mold and then pour in the chocolate. mine became pretty sticky and when i try to remove it it gets all sticky.. Grease and pour the chocolate. nice one Sailu. I have question instead of milk powder can i use condensed milk, if so do i need to make any changes in this receipe? My chocolate couldn’t harden, what did I do wrong? When I make my home made chocolates I set it in the freezer and when I take it out and remove them from the mould there is condensation. How do i prevent this as I plan to pack it in boxes. hi, regarding this, can I still use this type of chocolate when im going to incorporate a tropical fruit filling inside? Please I badly need a reply. Do you have recipe thats same like Cadbury Five Star? I really wanna try that!!! N how to make caramel sauce which it contains?? what if i used condensed milk instead of butter? ?is it ok?? There is some issue with sugar syrup consistency. Cut them with a knife into pieces if you cannot demould. Place in the freezer for a few minutes. My chocolate doesn’t set…what do I do?!? Hi… can I use salted butter, coz unsalted is not available in my area…. or can I replace butter with ghee? What brand of cocoa powder are you using for this preperation? Excellent. Thanks. We have used hand blender/mixie. Hey you used butter in this can u tell me which butter is used for making chocolates?? wat type of butter ? ?… can i use amul normal butter? What is the measure for 1 cup in terms of gms or ml? Can you also suggest recipies for making chocolates using chocolate syrup as an ingredient? i have prepared chocolate following the same recipe but my chocolate is not hardening even after 15-18 hours. what to do? You said honey can be used instead of sugar syrup. Can you tell me the exact measurement? and the change in method, if any? can we use salted butter ?? Plz tell What is the measurement of a cup in gms? Can I use Shea Butter in place of normal butter? I assume it will give more smoothness and good texture.. please advice. Can i use sunflower oil(white oil) instead of butter???????? Hi, how many days the chocolate stays good and where should we keep the chocolate to preserve it, means weather in fridge or can be kept outside fridge, please reply me..
You can refrigerate it for longer duration wrapped in foil or butter paper.